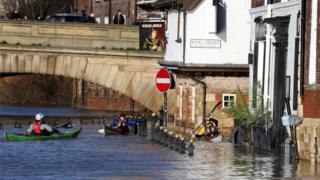 A stormy and warm December was the wettest month for the UK in more than a century, provisional Met Office figures show. It was also the warmest since records began in 1910, with temperatures around 7.9C (46F), making it feel more like a day in April or May. Overall, 2015 was the sixth wettest year, data showed. Record amounts of rain fell in storm-hit Scotland, Wales and the north west of England. The UK mean temperature for the year of 9.2C (49F) was warm but not exceptional, said the Met Office, and not quite hot enough to beat the 2014 record of 9.9C (50F). Usually, December temperatures hover around 4C (39F). Wet, warm Decembers: Can we expect more of the same? The Met Office says there is a direct link between the warmth and the record rains that brought widespread floods across Scotland, Northern Ireland and northern England. December was something of a freak month, it acknowledges. Climate change has raised UK temperatures by around 1C (1.8F) so far, so it will be many decades before this level of extreme weather becomes the new winter norm, it says. Other scientists say that with climate change, there will be no "normal" weather. England saw virtually no frost and, in the UK overall, there were fewer than three days of frost - normally, December would see about 11 frosty days. The Met Office has said storms Desmond, Eva and Frank were behind the record rainfall, while a humid south-westerly airflow kept it warm. Scotland, Wales, Northern Ireland and northern England bore the brunt of the storms, as central and southern England escaped the worst of it. December's warm weather had a considerable knock-on effect, with retailer Next blaming it for a "disappointing" trading performance in the run-up to Christmas. Media captionMatt Taylor tells us about December 2015 being the wettest month on record. December weather: Why is it so mild?